Everybody has their favorite foodie accessories. Whether a utensil, cookbook or ingredient, there are those reliable kitchen essentials that we all go back to time after time. At Local Aromas we are no different and have created our brand new Favorites page to share with you our go-to products that guarantee quality and value for money, and will bring a little touch of our Rome kitchen to your own home, wherever you may be. During our food tours and cooking classes we are often asked for advice on what to buy to be able to recreate the perfect Roman meal in your own home, our favorite local products to buy, or where to eat and drink in Rome. This prompted us to set up our very own favorites page where you can find all of our treasured gadgets, books, and ingredients along with links to purchase and deliver them to your own home. There are certain things that no self-respecting Italian cook would be without and we are happy to share with you the contents of our kitchen cupboards. Make perfect pasta every time with Mamma Giuliana’s beloved Marcato pasta machine: it has been in our family for four decades and is still going strong. 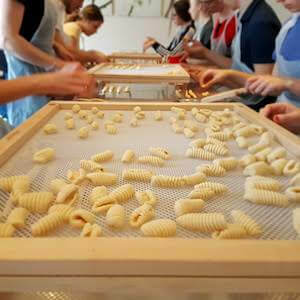 Anyone who has attended our cooking classes will know that a gnocchi board makes all the difference. Gently rolling gnocchi along this inexpensive wooden block creates the necessary ridges for the sauce to cling to and will make you look like a real pro in the kitchen. Lastly, the classic Bialetti Moka coffee machine is indispensable for making that perfect morning espresso, just like in Rome. If you have been fortunate enough to attend a Local Aromas Olive Oil Tasting you will know that buying a quality oil will undoubtedly change your life and your palate. Italy boasts incredible oils which are hard to track down overseas…until now. Our exclusive partnership with the very same place where we buy our olive oils, gives you access to over 150 excellent oils from across Italy, shipped right to your door. And if that wasn’t enough, you can also get 5% discount on orders over €30 by using the code: LOCALAROMAS. The proud culinary heritage of Italy means that once you nail a classic recipe, you don’t want to mess with it and there are some cookbooks which are fundamental to the kitchen bookshelf. Ada Boni’s revolutionary recipe book Il Talismano della Felicità contains all you would ever need to satisfy an Italian stomach and, although first published in the 1920s, remains the undisputed final word in traditional Italian home cooking. For a more modern approach on the Roman food scene, check out Australian-born blogger and author Maria Pasquale’s debut book I Heart Rome. A love letter to our beloved city, it contains fail-safe recipes for Roman staples from the city’s best restaurants and chefs, as well as notes and stories on the Eternal City’s rich gastronomic culture. If you prefer someone else to do the cooking, why not do a little advance planning for your trip to Italy with our favorite trusted restaurant guides to Rome and beyond. The Slow Food guide to Italy’s best osterie will ensure that you get good-value, satisfying meals made with quality local ingredients, while respected food and wine editor Gambero Rosso’s guide to Rome’s restaurants will help you to avoid the tourist traps and find authentic Roman cuisine during your Italy trip. As keen and frequent travelers ourselves, we understand that just a few key products can make a trip away from home more comfortable and convenient. We are excited to share some of our choice travel accessories with you, including the wonderful Chilly’s water bottles. These funky and functional reusable bottles help to make the most of Rome’s 2,500 water fountains (locally known as nasoni) which pump continuous potable water into the city to the relief of thirsty Romans and visitors during the long, hot summers as well as reducing the waste of single-use plastic bottles. So bring a little Local Aromas into your life and check out our Favorites page for a full listing of the products we love, use and endorse whole-heartedly. We will be continuously updating the page with our must-have foodie necessities and remember you can always contact us for any help, information or recommendations. Take a look at our favorite kitchen and travel products with books, gadgets and olive oil. Order online and get Local Aromas' favorites delivered right to your door.